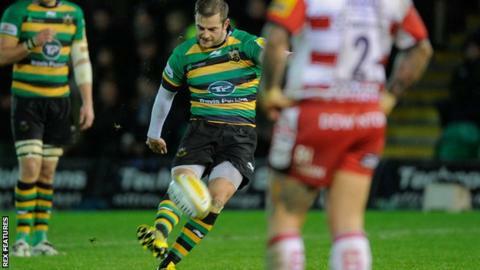 Northampton Saints battled to a hard-fought victory over Gloucester in the wind and rain at Franklin's Gardens. Stephen Myler kicked three penalties to put the hosts 9-3 ahead at half-time, despite losing captain Tom Wood to the sin bin for infringing at a maul. Two more Myler penalties after the break extended their lead to 12 points. But Saints, who handed South Africa great Victor Matfield his debut off the bench, were short of their best as they sealed a second league win this season. After losing at newly promoted Worcester Warriors on the opening night of the campaign, Northampton have since continued to stutter and suffered domestic defeats by Sale Sharks and defending champions Saracens. However, while they still remain without a try at Franklin's Gardens since May, director of rugby Jim Mallinder will be encouraged by the resilience shown by his players in overcoming Gloucester in difficult conditions for flowing rugby. He will also be boosted by the return of Matfield from World Cup duty, the 127-cap Springboks lock coming on for the final 21 minutes to make his Premiership debut. The 38-year-old adds further power and experience to a pack dominant throughout against the Cherry and Whites, setting the platform for Myler to kick five out of six attempts at goal. Victory moves Saints up to fifth in the table, level on points with Leicester in the final play-off place, while Gloucester remain in 10th. "Coming here it's always going to be a set-piece game, but those conditions meant that it was going to be a case of whichever team made the fewest mistakes, was able to control field position and didn't give away penalties." "I thought for long periods of the game we did control field position, but we made too many mistakes and obviously gave away too many penalties with a kicker of the quality of Stephen Myler on the pitch." "Scrummaging's not just about one player, it's about the whole eight - you've got to give credit to Northampton, it's what they've built their success around over the course of the last few years - a very strong set piece." Northampton Saints: Foden, Tuala, G. Pisi, Burrell, North, Myler, Fotuali'i, A. Waller, Haywood, Brookes, Paterson, C. Day, Gibson, Wood, S. Dickinson. Replacements: L. Dickson for Burrell (60), Hanrahan for Fotuali'i (51), E. Waller for A. Waller (71), Williams for Haywood (78), Matfield for Paterson (60), Harrison for Gibson (69). Not Used: Hill, K. Pisi. Gloucester: Cook, Sharples, Meakes, Hook, May, Twelvetrees, Heinz, McAllister, Hibbard, Afoa, Savage, Thrush, Moriarty, Kvesic, B. Morgan. Replacements: Purdy for Meakes (68), Dawidiuk for Hibbard (67), Doran-Jones for Afoa (63), Galarza for Savage (53), Rowan for Kvesic (67), Laidlaw for B. Morgan (53). Not Used: Y. Thomas, Kalamafoni. Sin Bin: Y. Thomas (80).